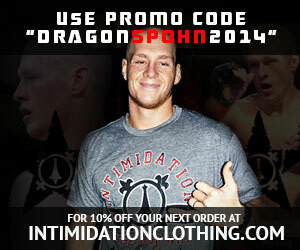 Intimidation Clothing is pleased to announce its sponsorship of unbeaten middleweight Jason Butcher (4-0) at Bellator 78 and on Spike.com. Butcher is set to face fellow unbeaten middleweight Shaun Asher (5-0) as part of the night’s preliminary card, and the bout will be shown on Spike.com. Bellator 78 takes place on Friday, October 26 at the Nutter Center in Dayton, Ohio. Butcher finished a 6-2 amateur record before turning pro in 2011, where he immediately picked up where he left off with a 45-second knockout over Strikeforce veteran Dom Steele in his pro debut. The 27-year-old continued his streak with three straight submissions, including back-to-back victories via his patented triangle. Most recently, he impressed in his Bellator debut at Bellator 71 in his native West Virignia, where he took just 63 seconds to tap Duane Bastress at the event. Now living and training in Southwest Ohio, Butcher is a member of the Jorge Gurgel Academy with the likes of Bellator women’s champion Zoila Gurgel and former UFC middleweight champion Rich Franklin. Intimidation will also continue its long-standing sponsorship of super popular middleweight Brian “The Predator” Rogers as he fights in a featured bout as part of the MTV 2 main card broadcast at the event as well as middleweight Mojo Horne on the preliminary card.